Hoo doesn’t know that we love owl-y designs here at Inhabitots? 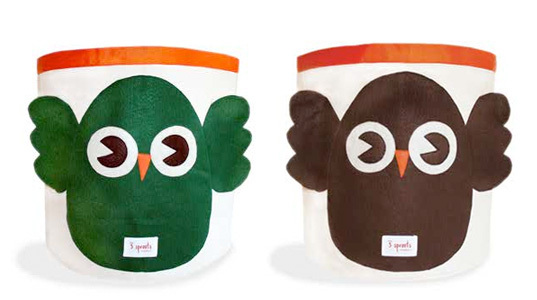 When I came across these organic owl storage bins by 3 Sprouts, there was no question that I had to share this find with our readers. The bins are made from 100% organic cotton canvas and 100% eco-spun felt (sourced from recycled water bottles); they measure 17 inches high, have a 20 inch diameter; and come in brown or green (or if you’re cuckoo enough to prefer elephants, you can choose shades of either blue or pink). So sturdy they stand on their own when empty, the bins are a wise choice at $44 (available at Half Pint). Hoo doesn't know that we love owl-y designs here at Inhabitots? When I came across these organic owl storage bins by 3 Sprouts, there was no question that I had to share this find with our readers. The bins are made from 100% organic cotton canvas and 100% eco-spun felt (sourced from recycled water bottles); they measure 17 inches high, have a 20 inch diameter; and come in brown or green (or if you�re cuckoo enough to prefer elephants, you can choose shades of either blue or pink). So sturdy they stand on their own when empty, the bins are a wise choice at $44 (available at Half Pint).